If I can’t think of any other categories for a post, it gets relegated here. Double Feature! Unpublished Frank Tashlin books! I’m sorry that I didn’t update last week. I was having personal problems; but that is no reason to shirk on my duties. So, to make up, I will post last week’s entry along with this weeks. Also, we’ll be switching to updates every Wednesday. (It’s easier for me) So let’s take a look at a couple of books, that Tashlin wrote, but never did anything with. This story takes place in two yards. In one, there is a chicken coop full of chickens naturally. The other yard contains an incubator that has only one egg inside it. (Seems like a waste of money) When the egg hatches, a black chick is born. Hope that makes up somewhat for dissapearing last week. It’s great to be back. This shoutout goes to a good friend of mine. How do you make awesome cartoons even greater? Put them together! With awesome music! That is just what some people do! They take a song, put cartoons to it and there you have it. A cartoon music video. My favorite person who does these, is the maker of the clip you see before you. (Unless he wants me to remove it. then you’ll have to find him yourself) He is my favorite because he uses the most Looney Tunes out of all others I have seen. He also chooses the best songs so says me. Heck, he even uses some of my favorite live action stars, like Kermit the frog, and the Nostalgia Critic. Go check his work out. He is not getting the respect he deserves. Merry Christmas Pal. This is why it took so long, for me to post this. I wanted to wait and make it a Christmas gift. Keep up the great work. I’ll keep rooting for you. Now then my favorite video game of all time is Super Smash Bros. Brawl. So what do you get if you combine that with my all time favorite show? You get awesome to the extreme, that’s what! This series is created by a very talented person who i call the cheetoh woman. (It is not what she calls herself its just a nickname i use) I have not heard from her in a while so when she came back i had to ask her if i could talk about her creations on this here site. I would rather not spoil these for you watch and enjoy, then go to her channel and watch more! Dr. Foolio demands you! It’s pure art! Pure genius! A true masterpiece! I have no idea how these are classified. I have read many differnt interpretaitons. One said these contain minor characters who do not appear again. Another said they are just music. I have found neither to be true. In my opinion they are exactly the same as their looney counterparts, just a bit more merrie. (yeah thats the ticket) I however am a fan of looney tunes to such an extent that i do not care. They are wonderful and every bit as enjoyable as the others. However if anyone can tell me a difference that i have not mentioned then i would love to hear it. 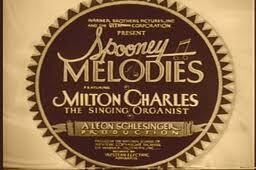 I am quite sure this is the first spoony melodie made and if you watch it you can easily see why they never made any more. It starts with some guy singing and we see some woods. A boat FLIES by and we see the moon. After that we see a city and the boat returns. That’s it, the end. Now it is not really bad but it is just freaking weird. This is the kind of thing that would have messed me up as a child. Then again i have seen weired things in my time. These are just the kind of things we have to put up with. Looney tunes did so well that leon schlesinger thought that these would be a good idea. What they would do is replace the real orgainst with a musical short in live action. Needless to say this was not a good idea because only four of these were ever made and none of them were any good. Although today you can not really find any of these i was lucky enough to find one and tomorrow i shall talk about it. See you then.